Can a cow be a box? 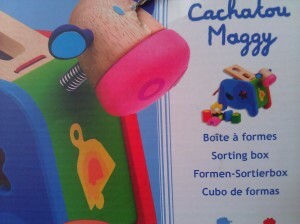 The toy is a shape-sorter in the form of a cow, and is described in French as a ‘boîte à formes’, which is translated as ‘sorting box’ in English on the packaging. In French, ‘boîte’ means a rigid container, among other things. (For a complete list, try WordReference.com). However in English, ‘box’ means a rigid rectangular container. A cow is definitely not rectangular, and I wouldn’t call a cow a ‘box’! Perhaps it could have been better described as ‘shape-sorter’. I imagine that the French text for this packaging was included in a long list of product names and descriptions, and that the translator did not have access to images, and so chose the most logical translation of ‘boîte à formes’. Unfortunately it was not the best option, in my opinion. Perhaps if the translator had been provided with images, they would have translated it differently.